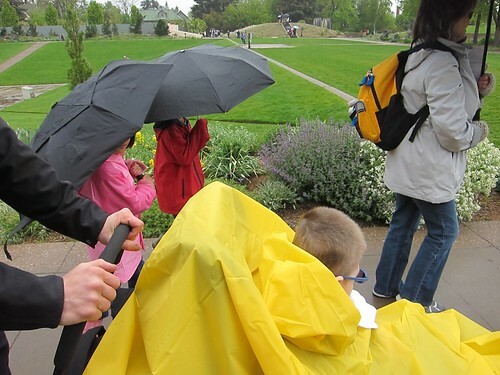 At the beginning of the school year, Max's teacher suggested we could join the class for their field trip at the Denver Botanic Gardens. Today was the day! We didn't tell the rest of his classmates that we were going to be there, in case the weather was bad, or a case of strep took half the class out. ;) So, we worked it out with his teacher, and showed up at the gardens at the same time they did. 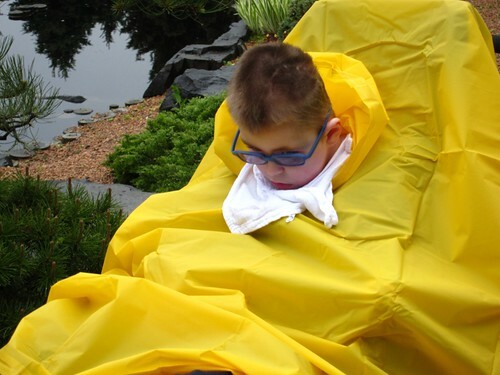 We got Max in his chair, with a bright yellow poncho, since it was still raining. (It's been rainy since Saturday!) One by one the kids were coming up and saying "MAX IS HERE!!!!". We got two kids in our group and walked around with his teacher. The kids were talking with Max, and with us, running around the gardens. As the kids from the other groups would come by Max they would make sure he knew where the yellow flowers were. He surely saw every single yellow flower in the park, thanks to his friends! They were there for 2 hours, but Max really lasted about 1 hour. When we had to take him to the van to change his pants, the kids decided it was because he was too cold and he needed to warm up. So, we went with it, and said that's what it was. In the end, he had his fill of fun, and was ready to go. Now we're home, and he's been asleep for the past hour and a half. It was such a great time! I can't believe school is almost out! He has track & field day either tomorrow or Monday, depending on the weather. We'll take him to the school for that too. Then, school is out next week! But, already we're getting requests for skypes over the summer and when Max gets his new bike, I think we'll have some bike rides with his friends in the neighborhood too! 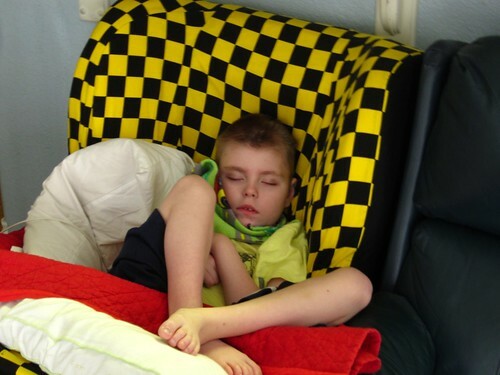 Precious story and experience for Max. Wow! who could have guessed this was possible. Looks like so much fun, so happy you could go on a field trip with your class Max. He had a great time, and was so worn out from all the fun that he slept 5 hours this afternoon! So glad that Max had a good time on his field trip. Really sweet the way his class treats him. They all seem so special just like Max. 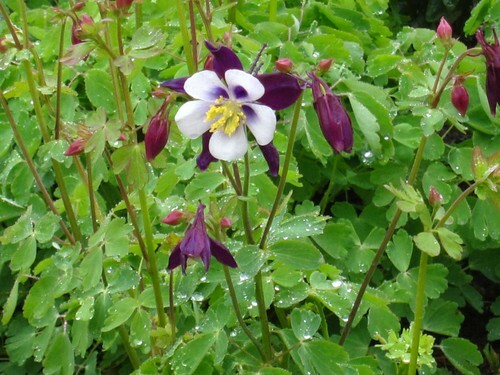 I love Columbine's also. They are beautiful! Purple and yellow what could be better? I am thinking they might be Colorado's state flower. Not for sure about that though. Not sure about my first post I guess it is floating around in space some where Lol.